The Olang Women's Patty Lux Winter Boot is undoubtedly the ultimate classic in the Olang collection. 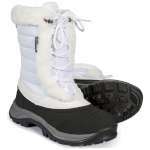 These snow boots are guaranteed to add fun to winter weather, giving warmth, protection and comfort. Ideal for a snowy day, the sole unit will help keep feet dry as well as help to prevent slipping over. Fully lined with wool and an additional multilayer innersole with aluminium film makes the Patty a luxurious present for any young ladies feet!